Your attack might provide the thrills, but it’s your defence that makes you a proper team, as well as delivering success in the long term. For most of us, our natural inclination is to want to be in possession of the ball and to try to bag a goal. So it’s not surprising that defence is too often overlooked. 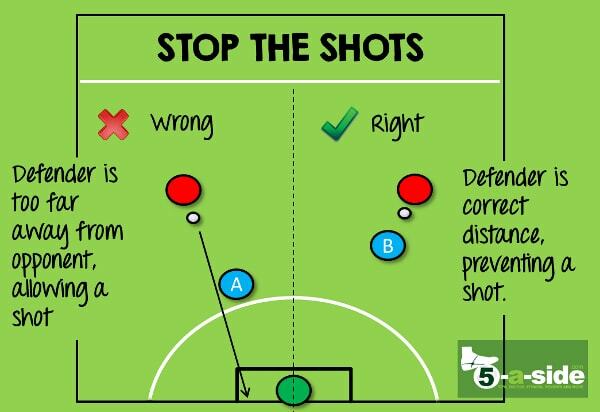 This article comprehensively covers the essential tips, tactics and strategies for defending in 5-a-side. These are the things that the good teams know, and the bad ones never seem to figure out. 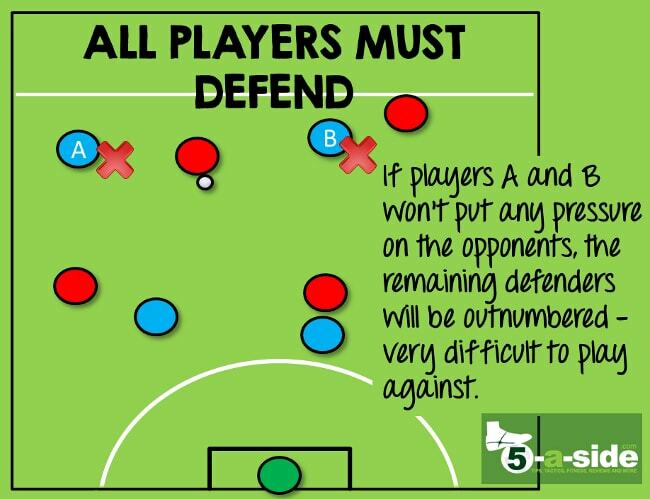 We’ll get into some specific strategies below, but if you want to know what good 5-a-side defending looks like, picture the way you’ve seen basketball teams defending. What that means is getting everybody back helping with the defense, positioning between the opponents and their target, in our case the goal. It’s about keeping them as far away from danger as possible. In a one-on-one situation a basketball player gets close to their opponent; close enough to make sure that any shots can be blocked. But crucially, they don’t go diving in at the merest sight of the ball. Instead, the idea is to frustrate and contain the opponent, showing them away from danger and waiting for an opportunity to regain possession. We’ll look at this in more detail below, but remember, what follows are a lot of tips – too many to apply all in one go – so work in one or two at a time. Bookmark this article, share it with your teammates, and revisit it regularly as you implement it bit by bit. Get the tips below right and you are going to be rock solid! 1. Cover against the counter-attack. It’s so very tempting to abandon defensive duties when your team is attacking. But far too many goals are given away by over-committing in attack and then being caught on the break. Make sure one player occupies a defensive position at all times – that doesn’t mean being back out of the action, it just means that they’re ready to intercept any quick breaks forward and changes of possession. You may want to rotate this responsibility throughout the game (quite a few teams do), but a lot of teams find it easier and more effective to trust this to one defensive rock: the ‘last man’ – a specialist position and solid defensive strategy covered in this separate article. Tip: 2 vs 1 situations are very common in small-sided football. 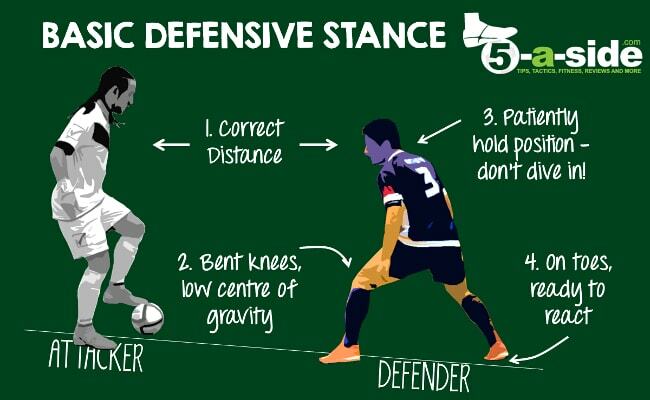 If you find yourself struggling with these, read our guide to defending 2 vs 1 situations. Some of the most important defensive moments are where you ‘transition’. That’s the instant that your team goes from being on the attack, to being on the defence. A natural reaction when your team loses the ball is to pause, then reluctantly start jogging back. But the first three seconds are crucial after a turnover and if you can instead condition yourself not to pause, but to react immediately, running quickly into your defensive position (which might be to immediately press the ball) then your team will be phenomenally hard to play against. You’ll be like a pack of dogs, making it very uncomfortable for your opponent. To be able to do this properly you have to be fit. I’ve said it before, and I’ll say it again: if you want to play good 5-a-side football you have to be fit. It’s a huge misunderstanding when a player thinks they’re not responsible for defending. 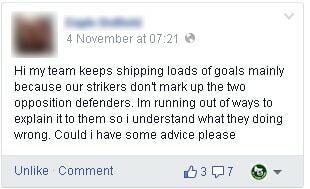 The attitude of “I’m a striker, I don’t defend” is utter nonsense for 5-a-side. Fives is more like basketball; you attack as a team and you defend as a team. You cannot afford to have anybody slacking off in defensive duties. That will only lead to you being outnumbered, which usually leads to your team getting punished. Everybody needs to play a part, and that’s mostly a matter of attitude. If everybody in your team doesn’t take on the collective responsibility for defending, then it isn’t a team at all. Practically, consider having a basic formation that you drop back into for defence. Dropping back into a compact 3-1 or a 2-2 can be highly effective way of getting this defensive discipline and can help you get organised. Collective responsibility in defending is the basic principle of 5-a-side defending that top teams really understand. Check out that link if you want a comprehensive look at this point: it’s how winning teams are made. When you’re taking up defensive positions, the basics are simple: get between your opponent and the goal. That way, you are blocking their route to scoring. On the other hand, if you let them past you then they’re in with a chance. That’s why it’s vital that, if your opponent makes a move forward, you follow them so they don’t get behind you. Player A is goal-side of the ball, but that’s not enough. Instead A needs to be goal-side of the player he’s marking, or at the very least blocking the potential pass. Here, player A’s opponent has run past him, and the pass in behind will lead to a clear chance at goal. The closer an opponent is to goal, the better their chance of scoring. So the obvious way of restricting chances is making sure that they don’t get anywhere near, by showing them away from goal. Try to (legally) block their way and direct them out of the zone where they can do any damage. In the example above, player A is defending by blocking his opponent’s path to goal, instead forcing them away from goal, down the side of the pitch where they can’t cause any problems. What A does not want to happen is for his opponent to get enough room to shoot at goal from his current position, or to be able to turn towards the centre of the pitch for a better angle at goal. By the way, the diagram above assumes that the outfield players can’t go in the area (that’s why it’s not marked in red). 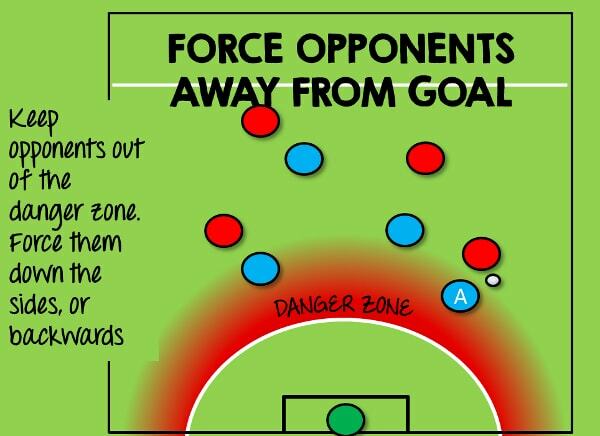 But the same principle would apply even if this wasn’t the case – you want to always keep the opponent away from goal. So, you’re blocking their route to goal and you’re doing your best Gandalf impression: “you shall not pass”. You’ve also got them outside the danger zone. What could possibly still go wrong? It’s now that you’ve got to worry about them having a shot from distance. Let’s be clear, a shot from distance is a lot better than letting them past you to shoot from closer range, but you still don’t want them having any opportunity. So, the key to stopping this is making sure that you get close enough the opponent, which means pushing out (i.e. away from goal) towards them. Some defenders get so obsessed with the idea that defending involves retreating that they forget that sometimes they need to go forward to defend effectively. Here, player A has failed to get close enough to the opponent, and as a consequence they have a sight of goal which they just might score from. On the other hand, player B has closed this gap and his opponent can’t see enough of the goal to make it worth trying a shot. The key to all of this is to get close enough, but not too close. Too close and they might dribble past you; too far away and they will easily pick out a shot. As a rule, the nearer they are to goal, the closer you need to be to them. The nearest player to the ball bears the responsibility for closing down the opponent. It’s as simple as that. As the nearest player to the ball, you have a decision to make: should you press the opponent or hold your position. If you’re not outnumbered then you always focus on the player with the ball, if you’re outnumbered, you have to consider holding your ground whilst you wait for cover from your teammates. So, you need to close your opponent down – that’s essentially what is known as ‘pressing’. The first and most important rule is that you approach with care. If you go rushing towards them, they’ll simply run past you and you won’t be able to recover quickly enough. Instead, close-in cautiously. Reduce the distance quickly so that they don’t have time to shoot but at the same time if you rush in too enthusiastically they’ll just dribble past you. The best way to make sure that you make up the ground is by moving towards the player as they are about to receive the ball. If you make up the ground at this point, you can stop by the time they receive the ball, being set and on your toes to react to their next move. Get your distance right – when the opponent is in the danger area close to goal, whether they have got the ball or not, you need to make sure that they are never much more than just over an arm’s length away from you. Bend your knees, get a low centre of gravity – this will allow you to quickly react to a change of direction, and make sure that you can stay between your opponent and the goal. Exploit weaknesses: Always press weaker players. If they’re better players, take advantage of them if the ball is on their weaker foot. Few players are truly comfortable on their weaker foot. Press only when safe to do so: Press in the right areas, with a set defence – sometimes it’s actually not wise to press a player; it’s more appropriate to stand-off slightly instead (e.g. if your defense is outnumbered). Don’t let them turn – if an opponent has the ball with their back to goal, this is highly advantageous position for you. You need to make sure that they do not turn from that position, usually by staying very close to them. The key to all of this is patience. Charging in against good players will only make you look foolish, as they easily dribble past you or just pass round you. Instead, it’s more effective to play a patient game. Don’t let your opponent past you; show them away from goal; block their sight of the target; restrict any shots. Make those your top priorities. Of course you want to win tackles but you need to wait for opportunities where it is safe to do so. Has an opponent shown you too much of the ball? Have they taken a poor touch? Have they received a pass and not properly got it under control? At those points it might be a good time to put a tackle in. So much of 5-a-side defending is about having patience and discipline. It’s about showing the opponents away from danger rather than trying to be a hero by diving in for tackles. Even though you need to concentrate on marking your own player, you also need to cover your teammate if they are beaten. This means positioning yourself appropriately to do both. 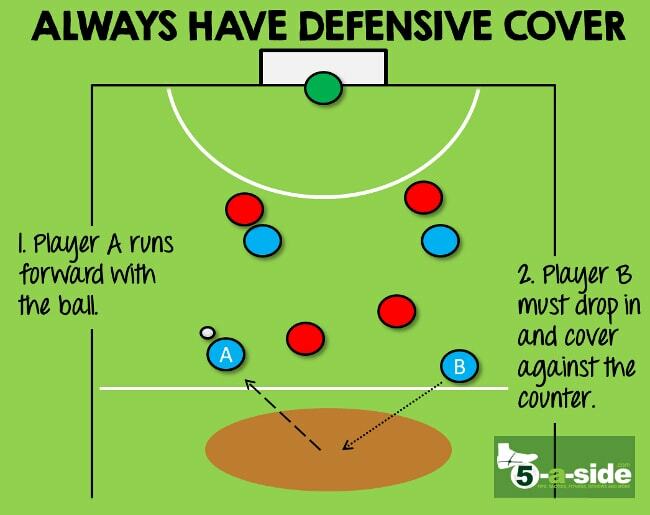 A good 5-a-side player covers their own opponent on defence. 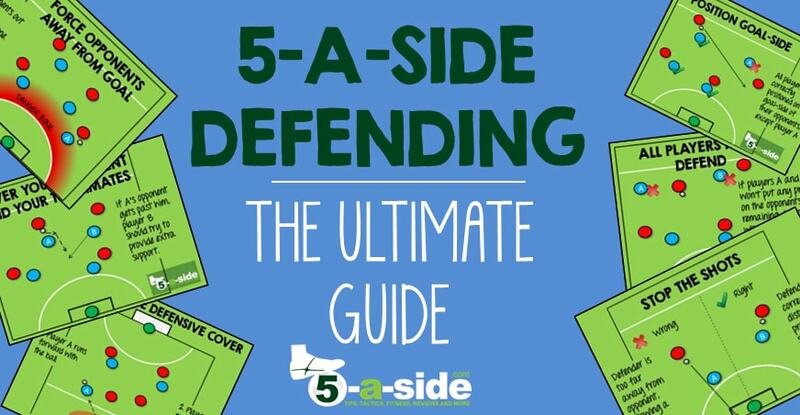 A better 5-a-side player will make sure that he also looks to cover his teammates. In the example above, B has taken a position where he can not only cover an opponent of his own, but can also be ready to help player A if his opponent gets past him. Ideally that won’t be needed, but of course it happens from time to time. Very few teams can organise a defence in complete silence. You need somebody to take control. Although defending starts from the front, communication comes best from the back. That’s where players can see a full view of all the action in front of them, it’s another important job that ideally I like my last-man to play. If somebody loses their discipline then it can quickly undo all the defensive efforts of the rest of the team. Just one rash moment that leads to a cheap free-kick can cost you a goal. This is one of the key tips in our 7 point plan for playing against a better team. It’s a sure way not only to concede cheap goals, but also for morale to plummet rapidly as well. What’s missing – what works for you that isn’t on the list? Are there any of these tips that don’t work for you? Why? What’s your number 1 defensive problem? Leave your comment below – I always respond and usually we all learn something from what you’ve got to say too! How fit do I need to be for 5-a-side – It really helps your defending if you’ve got the fitness to do it. How fit do you need to be, and how do you get there? It’s covered here. I love these tips but I have a question about number 4:Always be goal-side of your opponent. I feel comfortable defending like this but I have played with teams where everyone positions themselves in front of their man while defending. They try to position themselves between the opposition player with the ball and their marker and in this way they attempt to block the pass from happening. Has anyone got an opinion on this tactic? Personally I feel like they are just too lazy to get back to defend properly but I am not sure if I’m right as I have not been playing for as long as these other players. You raise a good point, sometimes it can be effective to position yourself in front of a player so that they have no chance of receiving the ball. The thing you have to watch out for in doing that is that you then can’t watch the player and the ball at the same time, so the player can move and you end up losing him. I think this strategy is fine, if you’re some distance away from the ball and you are confident that you can cover all sensible angles for a pass and are not going to get caught out. I think that’s a good point. Always punish moments when the attacker does not have the ball fully under control, or is caught being lazy. Intercepting passes can be a great strategy, but if you get it wrong, you’ve let the opposition past you easily. Thanks for the informative tips. I’m a coach for one men’s team and 2 ladies teams. I noticed that most of my defensive disciplines are similar to yours which are working out very well. I’m using 2-2 formation btw. 1) where should player A run when beaten? 2) If the defense line is beaten and the ball is towards the D area, which opponent should the GK mark/look out? 3) in this situation, where is the ideal GK position? 4) when is the best time the GK charge out? 5) if the above takes place, which player should overlap/take over GK zone? Would appreciate if u could give a few tips. 1) When beaten, player A should recover back behind the ball. In addition, as player B has now dropped in, player A may need to think about covering the player that B is leaving free. 2) If the defense line is beaten and the ball is towards the D area, the goalkeeper should only need to focus on the player with the ball as it’s now a 1-on-1 situation with him. The goalkeeper should, if they can, keep the other attackers in their peripheral vision so they are aware if the ball is going to be passed across to either of them for an easy goal. 4) Best time for the goalkeeper to come forward is when it’s clear that the attacker is in a one-on-one situation. If the attacker still has options to pass sideways then they’ll just go round you. Come out speedily and, if the attacker makes a mistake, or has a poor touch, pounce on the opportunity! 5) All players should come back towards goal. If the attacker delays shooting or the keeper makes a save, a quick-reacting defender can clear the danger. I’ve just started being coach to an under 9 team of 8 players on the small astro pitch, some of them without any competitive game experience. I’m being as gentle as possible of course not to overload them with tactics as we’ve just started…..
Any tips or strategies playing 8……. Do you mean general tips, or specifically how to coach defensive understanding? Hey. One thing I would like to advice is to do fouls when needed. Many players are well and disciplined, and in a fair match you may lose. I remember defending against a player and he managed the leviate the ball away from me. As the only player left was the keeper, I blocked his way and pushed the ball with my hand for a throw-in. That did avoid a goal (i was yellow carded, after I told the referee I that i ‘slipped’). So that’s just my advice. Hi Mayank, thanks for the comment. Some people would consider this cynical, but you’re absolutely right it does happen and you wouldn’t be the first person to suggest it. It all depends on how far you want to go to win. Personally, it’s not my style to do that. But then again, maybe I’d be the guy walking off without a win whilst you pick up the trophy! Each to their own – there will be people out there who do take your advice. Cheers. Thanks for the article. Are there any drills that a team without a coach could use to practice these tips? Thanks Yvonne. Yeah, you can practice easily. What i would do is find a small space and play some 1 vs 1 to practice the individual technique of defending. Then, I’d play a 2 vs 2 in a slightly bigger area – now you’re working on things like covering your teammate, pressing passes, showing the opponent into areas you want them. I’d then progress to 3 vs 3 and by that time you have all the defending points coming out. One thing that works well is a fun game where you play 4 vs 4. 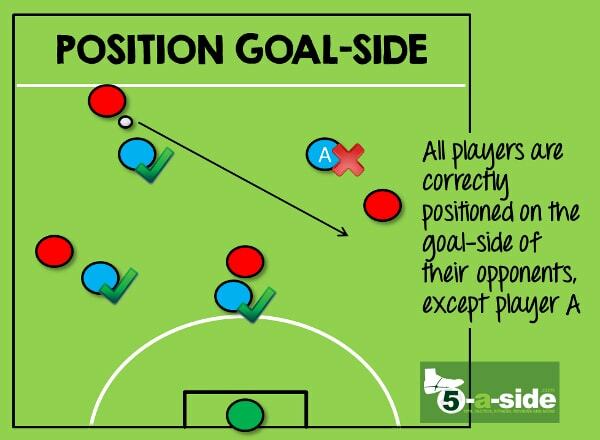 But you start off 1 vs 1, then as soon as a player scores, a player joins the opposition team, who play 2 vs 1 (will help you defending overloads), add a player to the team each time it concedes a goal. When you’ve got a team of 4 being scored against, they can’t add any more players and they lose. You can play again, but change who starts (as it is tiring for the players who go on first). Hope that helps.